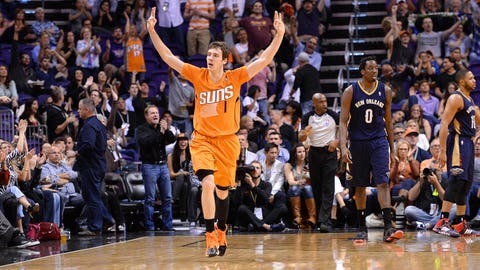 Goran Dragic (1) returned from an ankle injury and scored a career-high 40 points. PHOENIX (AP) — Goran Dragic scored 40 points, his second career high in three games, and the Phoenix Suns pulled away in the fourth quarter to beat the New Orleans Pelicans 116-104 Friday night, snapping a three-game losing streak. Dragic was a game-time decision because of a sore right ankle that had kept him out of Wednesday’s loss at Utah, but played all but the last 10 seconds of the second half in the first 40-point game for a Phoenix player since Amare Stoudemire’s 44 on March 19, 2010. Anthony Davis, also a game-time decision because of a sprained left shoulder, matched his career high with 32 points for the Pelicans, who lost their sixth in a row. Markieff Morris added 18 points and twin brother Marcus 15 for Phoenix. Eric Gordon scored 21 for New Orleans. Dragic, who had expressed some doubt after the morning shootaround that he would be able to play, had a career-best 36 in the Suns’ loss to Houston on Sunday. He hurt his ankle in the home loss to Minnesota on Tuesday. He had 15 points in the first quarter and 13 in the fourth, surpassing 30 points in a game for the eighth time this season. Phoenix took control with a 17-1 fourth-quarter run. Dragic banked in a 3-pointer from the top of the key, then sank an 18-footer to cap the outburst and put the Suns ahead 105-92 with 4:33 left. Phoenix looked to be in trouble late in the third quarter. The Pelicans used a 15-1 run to go up 77-67 on Austin Rivers’ two free throws with 2:59 left in the period. But Phoenix outscored the Pelicans 14-4 the rest of the quarter. Marcus Morris scored the first seven in the run, Dragic sank a 3, then made a driving layup to tie it at 81-81 entering the fourth quarter. New Orleans took a four-point lead early in the fourth and was up 91-88 on Brian Roberts’ driving layup with 9:47 remaining. Phoenix, though, scored the next six. Dragic scored on a drive, then Markieff Morris made consecutive layups and the Suns led 94-91 with 8:13 left. Neither team led by more than seven points in a first half bereft of defense, with the Suns up 56-54 at the break. New Orleans shot 58 percent in the half (22 of 38), Phoenix 56 percent (20 of 36). In the second quarter, nobody led by more than four. Al-Farouq Aminu’s two free throws put the Pelicans up 50-47 with 2:14 left in the half, then the Suns scored seven straight, P.J. Tucker’s 3-pointer giving Phoenix a 54-50 lead 52.9 seconds before the break. Gordon’s layup at the buzzer was ruled no good and the call was upheld on review, preserving Phoenix’s two-point edge. NOTES: New Orleans’ Tyreke Evans was a late arrival after getting stuck in the hotel elevator. He arrived about an hour before the opening tip. … The Suns’ Leandro Barbosa missed his fourth straight game with a sprained toe. … Phoenix avoided matching its longest losing streak of the season at four games. … Suns G Eric Bledsoe, coming back from knee surgery, participated in 3-on-3 drills and could resume full practice next week. … The Pelicans’ longest losing streak of the season is seven games.